resident; Phillip Poole, who recently restored the decaying VHS tapes to produce this 2010 digital version. The original footage was taken with an amateur analog camera in total darkness with only household flashlights for lighting and while the video quality itself is not the best, the film does contain some stunning underwater photographs which were taken around the same time by diver and photographer Erik Bjurström. The film recaptures the difficult descent through giant slabs of breakdown, the crawl through a narrow opening into the water-filled chamber, and, of course, those breathtaking scenes of divers suspended in the utterly crystal-clear aquifer. It's a 43meg file and the film's creator, Phillip, has granted full permission. 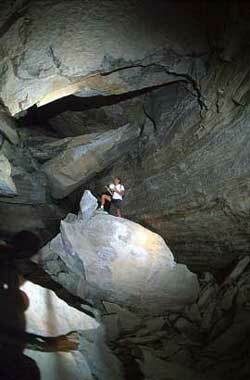 Ain Hit Cave is not only famous as a site for diving in the desert. In 1902 King Abdul Aziz Ibn Saud stopped here to water his camels before recapturing Riyadh with his tiny force of 40 men. Thirty-six years later the same king brought two oil engineers to the very same spot for an outing. One of these men was Max Steineke who noted that the water level in 1938 was up at the entrance level (137 meters higher than it was in Greg Gregory’s 2002 survey). The oil men immediately spotted the Bahrain cap-rock above the entrance. This was a layer of anhydrite known to be a kind of seal, under which trapped oil was likely to be found. According to Nestor Sander, who worked with Steineke, “It is entirely possible, even probable, that Max kept in mind the outcrop of anhydrite in Dahl Hit when he urged the deep test that was Dammam Well No. 7.” Shortly after the visit to Ain Hit, Well No. 7 finally gushed, after the drill reached 1440.18 meters below the surface (Sander quote courtesy of Greg Gregory). Arabic names have a long tradition of being spelled myriad ways in Roman letters, often within the same publication, and the right to do so was most vigorously upheld by T.E. Lawrence himself, who told his publisher: "Arabic names won't go into English, exactly, for their consonants are not the same as ours, and their vowels, like ours, vary from district to district. There are some 'scientific systems' of transliteration, helpful to people who know enough Arabic not to need helping, but a washout for the world. I spell my names anyhow, to show what rot the systems are." and no doubt there are a few more.